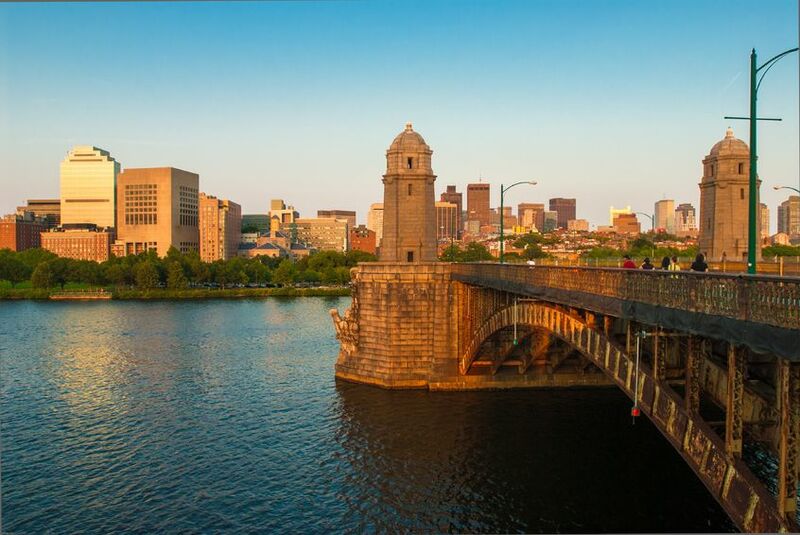 Boston is one of Petswelcome’s favorite cities in the U.S. but dog-friendly Cambridge, Massachusetts, located to the north of Boston, just across the Charles River, deserves special attention. Cambridge is home to two of America’s most prestigious educational institutions, Harvard and MIT, both of which have lovely campuses you can stroll through with your pup in tow. If you’re not staying right in Cambridge, both are easy to access by public transportation, using the Red Line of the MBTA and getting off at either the Harvard or Kendall/MIT stop. You and your pup are welcome to use Boston’s subway system, except during rush hour; keep your canine on a leash, off the seats, and away from the doors for his safety and fellow travelers’ comfort. Both Harvard and MIT are close to the Charles River, which should be a destination for your and your canine. A wonderful way to see dog-friendly Cambridge and Boston from both sides of the river is to walk across Longfellow Bridge (above) from Kendall Square, then along the Esplanade, with its beautiful views of the river, and then cross back over on Harvard Bridge, which will lead you right into the heart of Harvard Square. All together it is about a 3-mile walk. As you walk, you’ll pass the boathouses for the men’s and women’s crewing teams for Harvard and MIT. Time it right, and you might be able to catch one of the teams racing or practicing on the Charles. If your pet has had enough of the leash and needs some crazy-run-around-dog time, take him to one of Cambridge’s off-leash dog parks. Convenient to MIT is the Pacific Street Dog Park at 29 Tudor Street. Your pup can cool down in its water play area while you sit on one of the shaded benches to relax for bit. Dog-friendly Cambridge it chockfull of wonderful restaurants and bars that will welcome you and your best friend. One of our favorites is The Red House Restaurant, located in a renovated historic home that dates back to 1802. It has a secluded pet-friendly patio with a full canopy overhead for cooling shade. 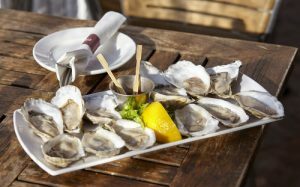 Red House is open for lunch and dinner and offers daily raw bar specials. Another favorite spot is The Automatic, at 50 Hampshire Street. The menu is fantastic and they’ve got an expansive dog-friendly outdoor seating area with umbrella tables. Try one of their creative cocktails, like the refreshing Tommy Noble, made with gin, Pimm’s lemon and bitters, or Mudslide, described on the menu simply as “frozen awesomeness.” If you get hungry, there are so many tasty options on the menu it’ll be hard to choose but how about their Parmesan-dusted Freaky Fries, which come with roasted bone marrow for dipping? Or their Korean Fried Chicken Sandwich? Or maybe the Crispy Shrimp and Pork Dumplings? And since you’re in a college town, no trip would be complete with a bar run. We love The Bar by the Elevator, at 1 Kendall Square. 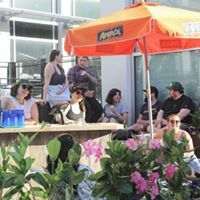 Call it a long-term seasonal pop-up, with umbrella tables and a tiki bar, it is open when weather is permitting. It’s pet friendly and the vibe is fun and friendly. You’ll find Negroni and rose wine on tap, as well as a concoction they call Froze (frozen rose). Finally, there are tons of pet-friendly lodging options, whether you want to stay right in Cambridge or across the Charles in Boston. But wherever you decide to stay, let Petswelcome be your guide to pet-friendly travel.